We’re here! But our internet connection is spotty. I will try to post when I can. The Cat and The Mouse are eating good! We’re heading to China to attend to some family matters, visit with family and friends, shop, and eat (not in any particular order). Best case scenario is I will be able to post from China. Worse case scenario, I won’t have access to the internet. In any case, I will be taking a lot of pictures and notes. Our Uncle W made a big batch of taro cake and shared some with us. When I was growing up, besides manapua, taro cake was one of my favorite choices at the manapua store front in Chinatown. 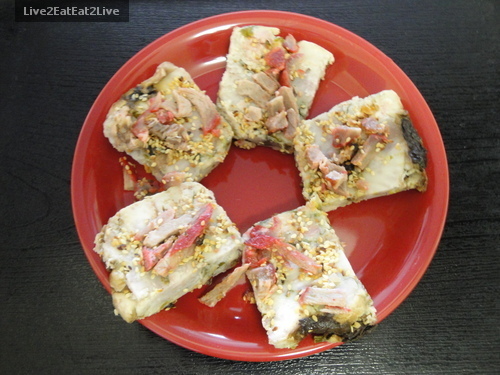 The taro cake is steamed with other ingredients such as charsiu, green onions, dried shrimp, and Chinese salted olives. I understand that making the taro cake is pretty labor intensive. Over the years, as ingredients got more expensive, commercial producers tended to cut back on or dilute the ingredients. Uncle W used large chunks of the Chinese barbecue pork, sesame seeds and Chinese salted olives (the black splotches near the edges). Chinese Taro Cake, By Uncle W.
The Mouse is too busy eating. This past Saturday, the stars aligned so that we ate out instead of cooking at home. We were busy running errands and I didn’t have time to prepare dinner. In addition, our little patch of chives were getting a bit overgrown. 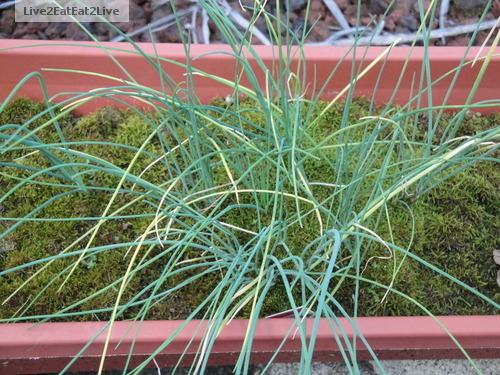 It may look like a bunch of weeds to you, but believe me, it’s a small patch of chives. We trimmed the chives and took it to our neighborhood go to Chinese restaurant. 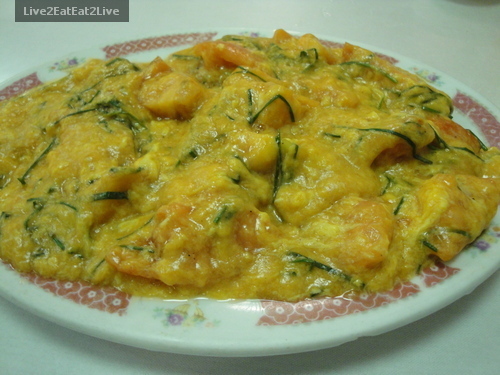 Since we consider ourselves regulars, at least the staff recognize us, we asked if they could use the chives and make tomato with eggs (if you are new to this blog, it’s one of the Cat’s favorite dishes). This is their version. Instead of keeping the eggs separate, they incorporated the eggs into the sauce. 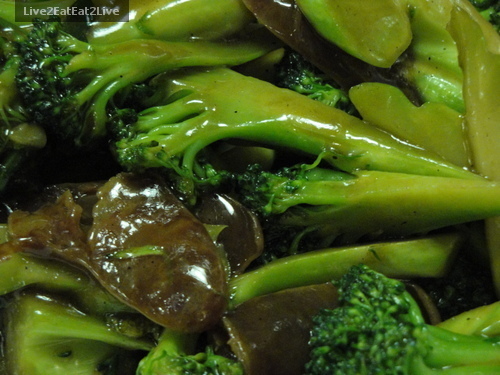 We also ordered broccoli with Chinese sausage (lup cheong, I think this is the Cantonese spelling). 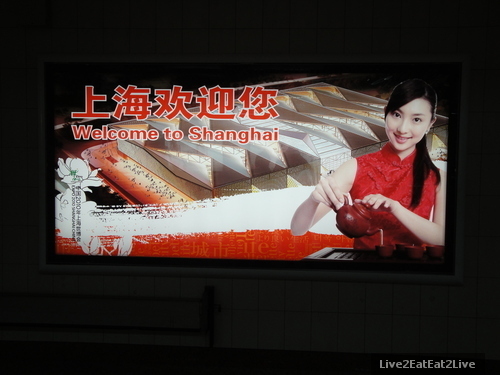 Kind of like beef broccoli except with Chinese sausage. 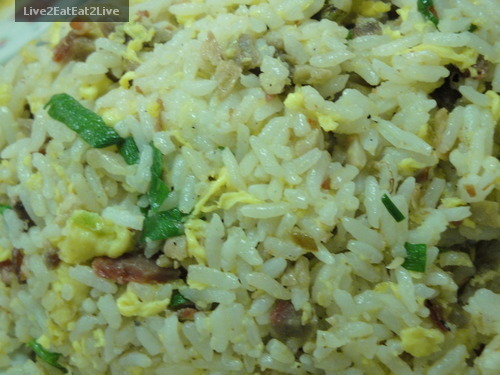 In my opinion, Kin Wah makes a killer fried rice. As always, Kin Wah makes very good comfort food. The tomato and eggs with the fried rice was excellent. The broccoli and lup cheong was a good change from beef broccoli. Here’s their website: http://www.kinwahchopsuey.com/ with a sample menu. The Cat and The Mouse ate till they were full and sleepy. I like carrots. I used to dip carrot and celery sticks in ranch dressing. Because I am trying to cut down on my fat intake, I started eating carrots plain without fat. Lately, The Cat said that I should eat my carrots with a little bit of oil because the combination provided better nutrition. She didn’t know where the information came from. By doing a bit of browsing, I came up with two sources. The U.S. Dept. of Health and Human Services and the U.S. Dept. of Agriculture in 2005 published guidelines that include a discussion that fats serve as a carrier for the absorption of fat-soluble vitamins A, D, E, and K and carotenoids. The European Journal of Clinical Nutrition in 2002 published an article that concluded that carrots release the most carotene by cooking and adding oil to them. The logic is that when the carrot releases its carotene, the body can absorb it. Yay!, a reason to eat fat (within reason). 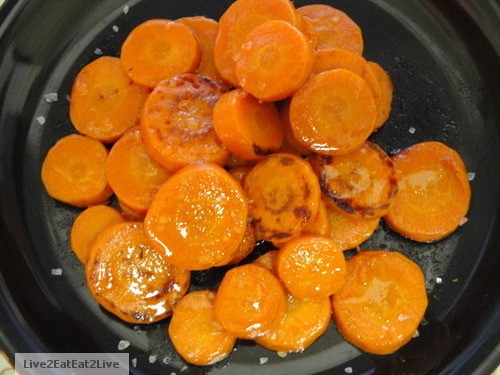 To celebrate, I pan-roasted some carrots in a little peanut oil and sprinkled sea salt and drizzled honey over them. Peanut Oil is cool (yin). Sea salt is warm (yang).